Wow…time really does fly…I can’t believe how long it has been since my last post! A really, really long time. What happened? Well lots of things have been going on in my RL including a very, very busy work schedule, a lot of travel and a computer that was not getting along with SL. I have popped into SL but not been able to spend much time there. Mostly lag and problems with viewers made it next to impossible to take pictures. Finally, with the new SL Beta viewer and some updates on my computer, things seem to be better. (Fingers crossed.) I have a new blog office inworld but I had to give up my wonderful mountain chalet when the winter sim where I had lived for 2 years closed down. So for now anyway my home is my office! I am amazed at the work being done on the grid right now. 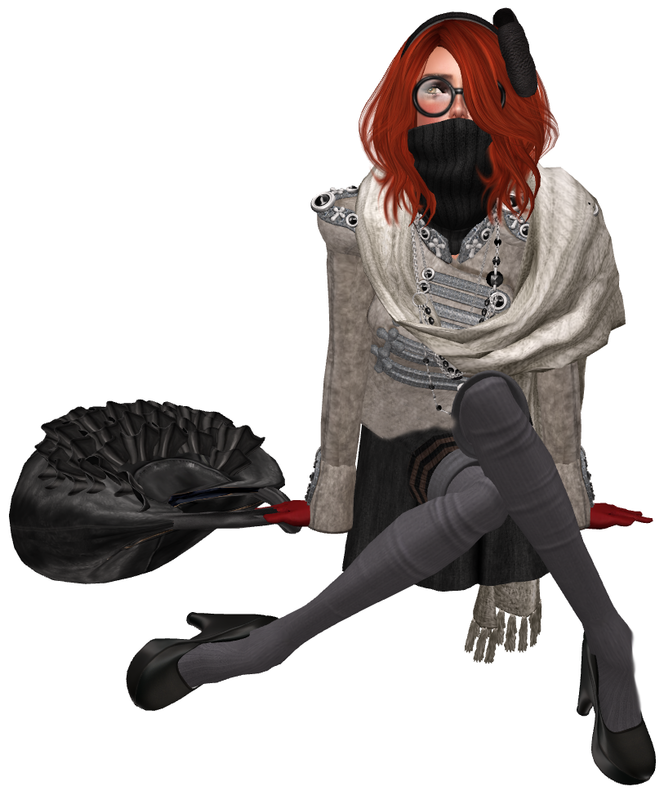 I love the mesh items and in addition to long-time favorite designers there are so many new and talented people adding their creativity to the mix. So just to say “hi” here I am in my office. I took these pictures a while back so I am wearing a couple of favorite older pieces here. The Lelutka jacket is not at all new but still a wonderful, wonderful piece. The long stole is actually a piece from Mr. Poet that is part of a coat set but I love the way it drapes over the shoulder and it is just the right color for the grey jacket. (The oversize turtleneck is from the same outfit and I love it because of the way it can come up and cover the bottom part of the face.) The softly pleated skirt is from mon tissu and like everything those girls do it is beautiful in design, construction and texture. The gloves are from Marni Grut at Royal Blue and come in many wonderful colors. I am a big fan of gloves in SL and these are great..you will want the fatpack. So see you soon and for details on what I am wearing see below!